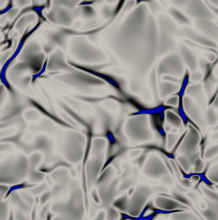 A new ANR research project called EDGES has been launched in 2018 for four years to determine the main specificities of turbulence in the context of highly compressible turbulent dense gas flows, propose new models for RANS and LES approaches and apply them in the context of turbomachinery applications. This presentation will address the first work-package of the project : The realization of a DNS database of turbulent dense gas flows in academic configurations (HIT, Mixing layer). Turbulence statistics and spectra in presence of complex Equation of State will be analyzed and compared to that obtained when perfect gas modeling is used.